“Children should get their teeth brushed at school, says NHS watchdog,” The Daily Telegraph reports.The headline follows the publication of guidance by the National Institute for Health and Care Excellence (NICE) on ways for local authorities to improve the oral health of their communities. The new guidelines have been welcomed in some parts of the media, but others have accused NICE of creating a “supernanny state”. The guidance follows a recent Public Health England survey that demonstrated the wide disparity in oral health across the country, particularly among younger children and vulnerable socioeconomic groups. from more than a third of children in Leicester, to just 2% in other parts of the country. As NICE says, dental problems such as tooth decay and gum disease can have a wide range of effects, not only causing pain and the need to remove decayed teeth, but affecting a person’s ability to speak, eat, smile and socialise. The recommendations aim to help authorities commission health, social care and educational services that promote and protect oral health. This includes advice on ways to improve oral hygiene, such as reducing the consumption of sugary food and drinks, alcohol and tobacco, increasing the availability of fluoride, and encouraging people to get regular dental check-ups. Among these recommendations are those focused towards improving oral health among young and school-age children, including considerations for nurseries and primary schools to supervise tooth brushing in children at high risk of tooth decay. 0. Public services (including leisure centres, community or drop-in centres, nurseries and schools) make plain drinking water freely available and provide a choice of sugar-free food and drinks, including vending machines on site. 0. All health and wellbeing policies and services for adults, children and young people should include advice and information on nutrition and wellbeing, and how tooth decay and gum disease are preventable; this includes educating people on the importance of regular tooth brushing and tooth brushing techniques, the importance of fluoride toothpaste and regular dental check-ups, and the links between high-sugar diets, alcohol and tobacco, and poor oral health. Specific to younger children, NICE recommends that all early years services (including midwives and health visitors, children’s centres, nurseries and childminding services) should have a requirement to train staff in giving oral health advice. A recommendation that has stimulated the most comment and debate in the newspapers is that nurseries and primary schools in areas where children are at risk of poor oral health should consider supervising children in tooth brushing. Such schemes would include having a requirement to get consent from parents or carers, and provide free toothbrushes and fluoride toothpaste – one set for the premises and one to take home. In high-risk nurseries and primary schools, where supervised tooth brushing is not possible, a fluoride varnish programme should be considered. 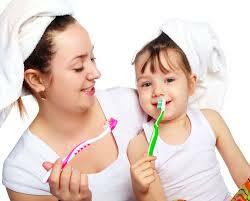 This involves coating the teeth with a film of the chemical fluoride, which has a protective effect against decay. At least two applications of fluoride varnish a year would be needed. NICE also includes recommendations to raise awareness of the importance of oral health during a child’s school years. This includes similar policies to above, of having healthy food and drink choices available, ensuring that opportunities are found in the curriculum to teach the importance of maintaining good oral health and highlighting how it links with appearance and self-esteem. What has been the response to the recommendations? Early intervention at a young age, through education on effective dental care both at home, and reinforced at school, could make a lifetime’s worth of difference. As Elizabeth Kay, foundation Dean for the Peninsula Dental School, Plymouth, says: “Around 25,000 young children every year are admitted to hospital to have teeth taken out. Given that we know how to prevent dental disease, this really should not be happening. “If there were a preventable medical condition which caused thousands of young children (mostly around five years old) to end up in hospital to have body parts removed, there would be an outcry. Analysis by Bazian. Edited by NHS Choices. Follow Behind the Headlines on Twitter. Join the Healthy Evidence forum.